Last Halloween, they made me wear bells. This is what I got stuck with this Halloween. I think I liked the bells better. I had to wear this yesterday at work. Then, they made me put it on again today so they could take photos. Christmas had better be good. Lots of toys, I hope, to make up for this. The Ultimate Chihuahua Care Handbook by Michael J. Warren is a very useful guide for chihuahua care. This review covers the second edition. 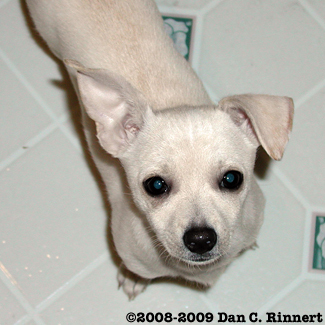 It starts out with a description and brief history of the chihuahua along with some basic information. It’s interesting, though not a necessity in a care handbook. Still, there are some useful tips included in this section, such as the need to keep the dogs warm during the winter months (if you live in a cold climate). The next section covers the characteristics and temperament of the chihuahua which can be useful for understanding your dog’s behavior. In the following section, we get to the actual care of your chihuahua. This section is pretty thorough, covering bathing, exercising, feeding, grooming and nail care. 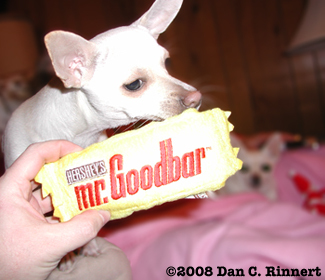 As you would expect, these are written specifically for the chihuahua’s particular needs and temperament. It’s not just generic dog advice! And, yes, chihuahuas do love cheese! Next, is the health section. This is a very good section covering the particular health needs and problems of chihuahuas. Again, this isn’t generic dog advice presented as being for chihuahuas too! This is advice specifically for chihuahuas, covering everything from their trachea issues to knee problems. The next two sections cover review who may make a good owner of a chihuahua and the pros and cons of having a chihuahua. If you don’t have a chihuahua and are on the fence whether or not one is right for you, these sections can definitely assist you in making that decision. The next section covers housebreaking. Unlike other sections, this section seems like generic dog training advice. And, I’m not necessarily sure I agree with it. The crate training method never worked with either Little One or Little Too. It just turned out… badly. Paper training, which the handbook advised against, seemed to work better. Of course, the difference may be in using puppy pads rather than newspaper. The puppy pads are supposed to have a scent that make training easier. As such, it was easier to teach them to use the pads than any other method. 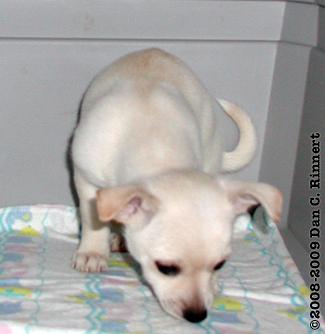 There is also a short section on breeding, which may be useful if you are interested in breeding your chihuahua. It gives a good overview, but you would probably need a more extensive guide if this is something you’re really interested in doing. 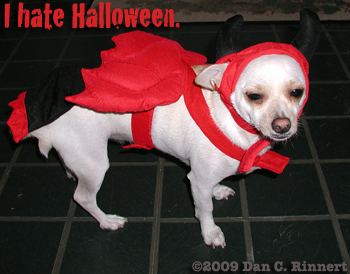 The remainder of the book gives some additional chihuahua facts and discusses some common myths about chihuahuas. There are also some chihuahua rescue resources. Overall, it’s an informative guide and a good deal. To learn more about The Ultimate Chihuahua Care Handbook, click here to visit their website. I grew up a lot since then. I didn’t get a cake on my half-birthday. I hope I get one today? My sister got a cake on her birthday. Well, I guess she didn’t get cake last year, but this is my first birthday? Shouldn’t I get cake for that? They say I can’t have chocolate cake though, because chocolate not good for doggies. That makes me sad. They say it can make my heart beat too fast or something. I don’t understand it. Maybe I can have a cheese cake? I asked my friends on Twitter. Did you know I’m on Twitter? You can tweet me @Little_Too. How do you celebrate your dog’s birthday? Do you let her have cake? 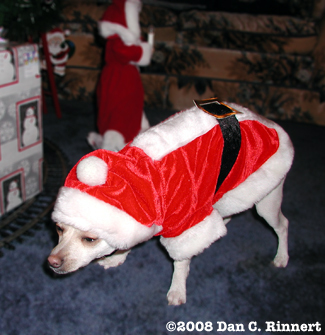 At first, I didn’t really like Christmas. But then I found out about presents. First I got a chew rope toy. Multi-color. I liked it. It has a squeaky. That means it squeaks! I like squeaky toys. I started to chew it up too. But there’s no chocolate inside. Little One got some toys too. I stole one of them. Will probably take the other one later today.